If you ask me, Crown Princess Mary has one of the fastest growing private jewel collections in all the lands. She doesn't top the list for number of tiara options, but she's amassing quite a group of modern pieces, both for casual wear and for serious gala wear. Her wedding day was the first sign of what was to come. Not only was her tiara a newcomer, a gift from Queen Margrethe and Prince Henrik and thought to be an antique purchased for her (it's not the most popular tiara, but adding to an overall family collection these days has merit of its own), her earrings were custom pieces made for her wedding day. Designed and hand made by Marianne Dulong, they feature pendants of large South Sea pearls inside hoops of white gold with brilliant diamonds around the edge. 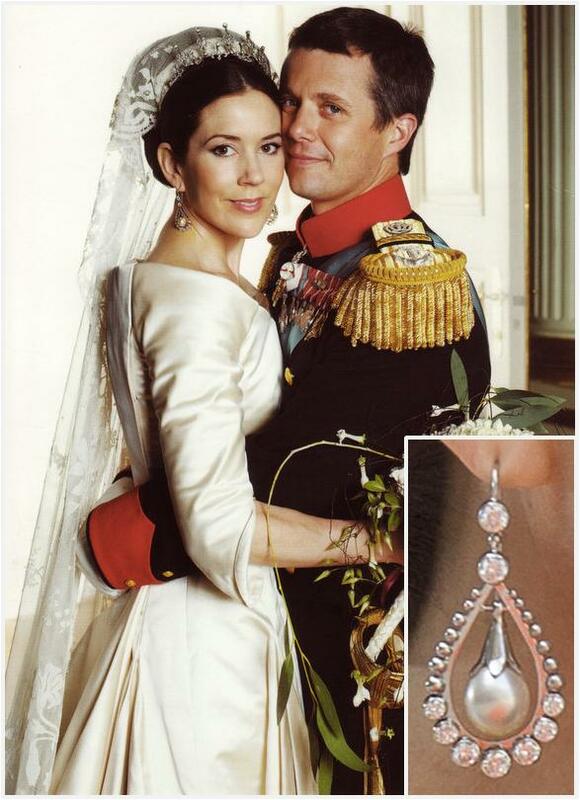 The Danish firm has remained a favorite jeweler for the Crown Princess, and was responsible for the revamp of the Danish Ruby Parure as well as the later addition of removable pearls to her diamond wedding tiara. Since the 2011debut of that optional pearl tiara setting, the wedding earrings are an even better match. They've become my favorite part of the set of pearl jewelry Mary has built for herself, elegant and modern but also pretty serious pieces of jewelry on their own.